Most people have little experience in determining what kind of flooring system is best for what you want to do. We at Stagestep are here to help. to selecting the best flooring system for you. Ready to order or have questions? Contact us via email or phone. Do you own or rent the space? Is this new construction or a renovation? Will this be long-term or short-term use? 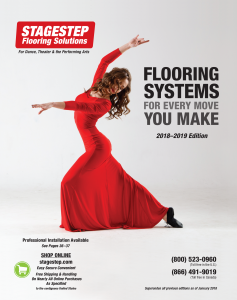 Do you want your floor to be portable, permanent or semi-permanent? What kind of floor or slab is currently in the space? What is the slab/floor’s current composition? Where is the space (basement, first floor home, commercial space, theatre)? What is the length and width of the space (in feet or meters)? Are there any unusual structures in the space – columns, doors, jog in / outs, radiators, steps, windows, equipment? What activities will take place on the floor? Is the space under supervision while in use? Will the space be occasionally used for other activities such as receptions? Will equipment be used or placed on the floor? Does the flooring system have a means of reducing vibration after impact? Can the system be modified easily for special conditions (multi-purpose / heavy equipment)? How do I repair damaged areas without replacing the whole floor? Can I take the floor or flooring system with me if I move?